Blindspot Cycles hits two high points of green design with their line of reconditioned electric motorcycles. These discarded beauties are first found at junk yards and then converted with a rack of batteries, electric motors and controls. Think of it as Mad Max meets Tesla. I spent an afternoon at their shop talking with the owner Chris Ravana about not just bikes but how we can rethink sustainability from the ground up – read on for an exclusive report! The principles that shape the construction of these bikes are straight forward: reuse it, keep it local, and make it work and look good. Reuse starts with a trip to a salvage yard looking for the right cycle. All makes and models have potential. They first help a client choose just the right ride. Now comes the fun part: stripping the unit down. They are looking to keep the bike’s feel but replace the internal combustion engine with and electric powertrain. 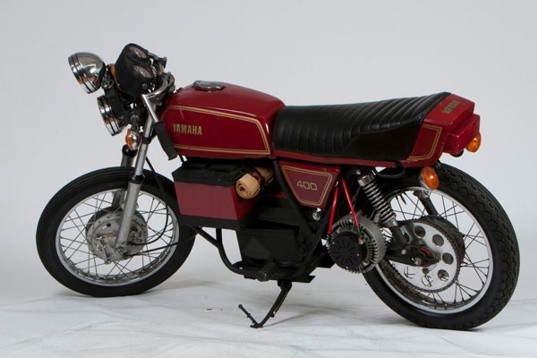 These reclaimed motorcycles squeeze the past and future together. Coupled with a DND DC permanent magnet electric motor, a set of Deka brand AGM batteries and some styling you get a homebrew, super efficient ride. If they can find it salvaged rather than new it goes on. If it is high quality and American made then it goes in. As far as looking good we will let you, our dear reader, be the judge. Blindspot Cycles consists of Chris, his wife, a mechanical engineer, and an electrical engineer. Appropriately, the office and shop is a reclaimed and converted brownfield gas station. The next step is to install solar electric panels so the operation is making its own energy as well. With such few moving parts these bike will last for years, and the best part is when you want to upgrade you can get a fresh set of lithium-ion polymer batteries and you are off to the races — ahem — work. When Chris jumped on his 36v Red Racer and silently took off, it all came together: this was a sweet ride. I love this way of thinking. Starting from a clean slate isnt always the best option. 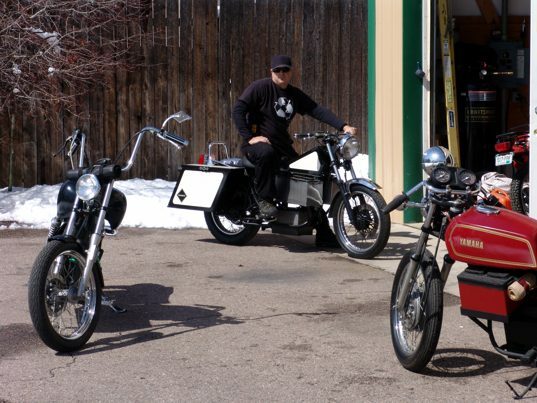 Blindspot Cycles hits two high points of green design with their line of reconditioned electric motorcycles. These discarded beauties are first found at junk yards and then converted with a rack of batteries, electric motors and controls. Think of it as Mad Max meets Tesla. I spent an afternoon at their shop talking with the owner Chris Ravana about not just bikes but how we can rethink sustainability from the ground up - read on for an exclusive report!